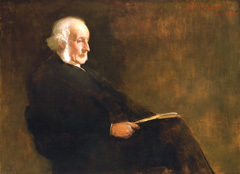 James McCosh took office exactly 100 years after his fellow Scot, John Witherspoon. He came to Princeton from Queens College, Belfast, and was already well-known throughout the English-speaking world as an author, philosopher, and Free Churchman. One alumnus, who had been a freshman in 1870, compared the new president’s influence to “an electric shock, instantaneous, paralyzing to the opposition, and stimulating to all that were not paralyzed.” McCosh gathered a distinguished faculty; revised and modernized the plan of study; developed elective course options; and instituted graduate work. He founded schools of science, philosophy, and art, and he began an ambitious program of building and planting that greatly enhanced the formerly bare campus. A strong proponent of the Greek idea of “sound body, sound mind,” he included a gymnasium and a library in his building program. Like John Witherspoon before him, McCosh took a commonsense approach to the curriculum of the College, one that was liberal yet firm. McCosh enriched the extracurricular life of the campus, making the “four long years” more enjoyable. During his time, many undergraduate activities began to assume their present form. The Glee Club, the Dramatic Association (later known as the Triangle Club), and the first intercollegiate football team were formed under his benevolent gaze. And, although he disapproved mightily of secret Greek fraternities, he allowed a group of upperclassmen to form the first permanent eating club. Throughout his life, McCosh shared credit with his wife, Isabella. “She advised and assisted me in all my work,” he said. Daughter of an eminent physician, Isabella McCosh was Princeton’s unofficial nurse, the one and only medical presence on the campus. Later, when the trustees built an infirmary, they named it for her.